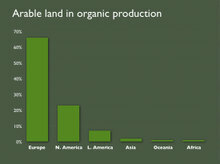 I see a big difference between the pie- and bar-chart versions of the "Arable land in organic production" slides. I see the pie charts as showing each continent's share of the world's organic production. The continents' shares will add up to 100%, which is inferred though the use of a pie chart. 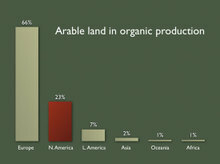 I see the bar charts as showing what percentage of each continent's arable land is being used for organic production. 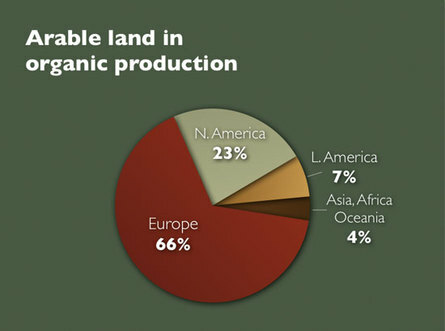 The pie charts are telling me that Europe is the source of most of the world's organic production while the bar charts are telling me that Europe's land is more likely to be used for organic production than other continents' land. It’s no wonder Mackey’s slides weren’t as dazzling as his stores are. 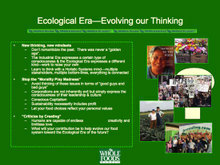 The company culture within Whole Foods Market (WFM) disdains PowerPoint. 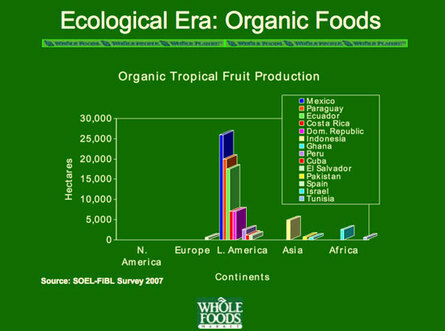 I spent some time at WFM as a marketer and remember being told not to use PowerPoint when putting together marketing strategy documents. WFM prefers verbal discussion and two-page overviews instead of visual PowerPoint presentations. Garr … excellent job on doing a PowerPoint makeover for Mackey’s slides. John: I'm a firm believer that people who claim to "disdain PowerPoint" are under a far deeper obligation to make their presentations better than those who "adore PowerPoint." Disdain for the medium should result in your improving the medium, not wallowing in it. Garr: When I first read the data points, I envisioned a world map, where the continents were blown out of proportion, based on the metrics. I thought this would drive home the point. Good or bad idea? Really strong and thought-provoking post Garr. My one question - if this presentation was important to Mackey, why didn't he sit down with a design prefessional and hammer out even a handful of ideas such as those you've so excellently scamped out here? The presentation either matters or it doesn't. If it doesn't, then DON"T make a presentation. Nice review of the presentation, Garr. I wonder what Steve Jobs would say if he saw this presentation. 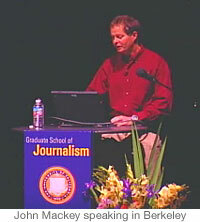 Personally, I can't even stand the look of these "ugly bill gatish" presentations; I know I am not alone. Jokes apart, I think presentation basically comes down to story telling and telling it in a way like you would to a friend and not present per se. 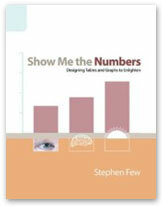 Now, the use of pie charts is quite subjective. 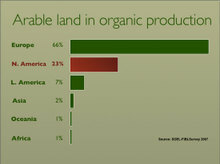 I liked the pie chart you came up with, its SO much better than the one in Mackey's presentation. 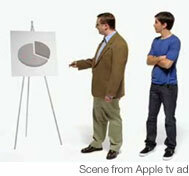 I also liked the 2d pie chart SJ used in his presentations to display the market share for iTunes, etc. It subtly conveys the message that less is more. Will you give some comments on my recent post? You often seem to think that putting a large photograph in the sterile picture bank style in the background of a single sentece is "the" way to put together presentations. However, the way you put pictures of anonymous people in the background just makes the message weird: you're pulling them out of context in an effort to make them represent a general idea or a thought, and it doesn't work. What's the message in putting an Asian woman in the background of your slide that says sustainability is good: I say it screams out loud "look, we've got this one Asian and also a woman here to illustrate what sustainability really means". You don't see a problem with that, at least in the sense that the photos are cliched to say the least and just make the slides dull. Sorry about the broken English. I think you may have misunderstood my point. The point was that it is often (not always) better to segment a bulleted slide into several slides. That is, to breakup bulleted slides with many points into visuals that come in behind the speaker as he focuses and elaborates on one key idea at a time. 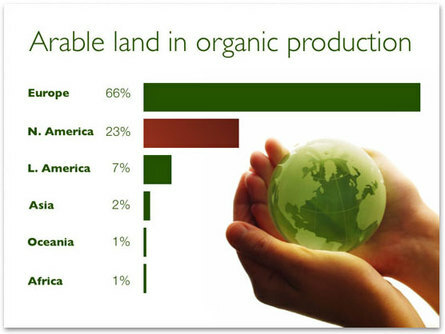 The one point in this slide is *not* "sustainability is good" as you say (that is hardly a point). 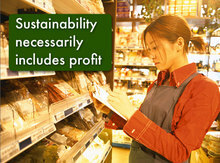 His point was that "sustainability necessarily includes profit," that is, it is *a business. * It's a business, that's his point. Showing one of his workers in the *background* (with the text message prominent in the foreground) is not out of context, nor does it make the message "weird." Are you saying, then, that the 10-second display of a dense text-filled bulleted slide with several different items that were not touched on is better than a visual with one key point at a time? 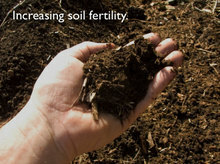 You could just go with nothing more than the text in this particular slide as well. The image of the store clerk taking inventory (doing business) is just an example, an option, one idea among many possible treatments. And I'll give you the benefit of the doubt, but I must say I am not sure why the store worker being Asian and female is so noteworthy and "weird." 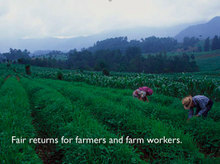 This particular image is from some stock CDs which I purchased last year for an organic food store project. 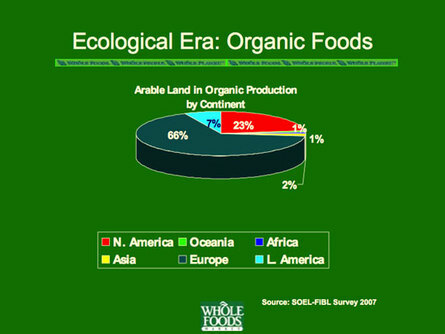 It is just a sample -- If Whole foods ever used an image like this obviously they can take snaps of their own stores. "When I first read the data points, I envisioned a world map, where the continents were blown out of proportion, based on the metrics. I thought this would drive home the point. Good or bad idea?" ...is certainly very memorable and follows the same idea. It's interesting to see your versions of the slides and I do feel that they have a stronger visual impact and convey the message better. 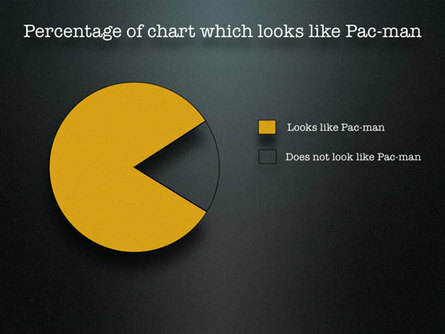 However, I don't have the same disdain for pie charts. Well, maybe the 3D ones with ugly colours that are difficult to read. Could this be a corporate thing? I do feel that your pie chart conveyed the message as efficiently as the bar charts. I have always found this type of chart to be a poor communication tool. It suffers from some of the same problems as the twisted, 3D graphic. It's very challenging to compare the mass of multiple irregular shapes. Thanks, Garr and Bruce, for the response about the map concept. I was wondering if it was too esoteric to communicate the information. And I fear that it may be. On that very point, I just happened to stumble across Worldmapper (http://www.worldmapper.org) which provides a number of "distortion of geography based on metrics" examples.